Renal Corpuscle is a part of the nephron. 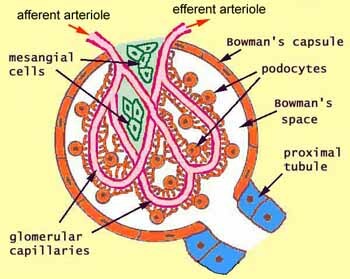 The glomerulus is the tuft of capillaries extending into Bowman’s capsule. a. Lamina externa: Contains heparin sulfate (glycosaminoglycan) that prevents negatively charged proteins from entering Bowman’s space. b. Lamina densa: Contains type IV collagen that prevents large molecules from entering Bowman’s space. c. Lamina interna: Contains heparin sulfate (glycosaminoglycan) that prevents negatively charged proteins from entering Bowman’s space. The mesangium is the interstitial tissue between capillaries, which is made of mesangial cells and Extracellular Matrix. Mesangial cells are phagocytic, can contract, have receptors for angiotensin II and atrial natriuretic peptide. It has a parietal layer made up of simple squamous epithelium. It has a visceral layer made up of modified simple squamous epithelium called podocytes. Podocytes have primary processes and secondary processes called pedicels. There are slits between adjacent pedicels, which are bridged by diaphragms. The space between the visceral and parietal layers is called the Bowman’s Space. Elite models of Chennai can be accessible whenever in any piece of the city for all recognizing man of honor. We need you to visit us over and over for that intention be to acquire some new Independent Escorts Chennai consistently. With the goal that at whatever point you visit Us, You get some freshness in our administrations. We bring the young ladies escorts from better places which give your assortment with quality.